i love the fourth of july, and i had the best day yesterday with my roommates and friends, but more about that later. today is just about the food, and awesome food at that! 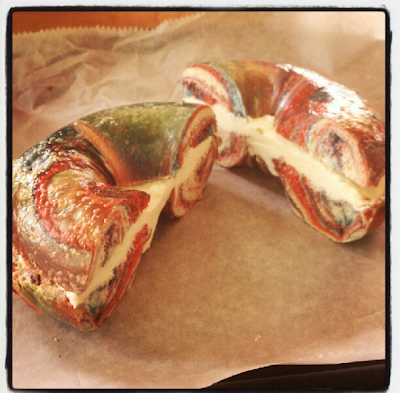 red, white, and blue bagel from brueggers! * jello shots: red = raspberry and peach jellos with gummy vodka; white = vodka with a splash of berry seltzer; blue = berry blue jello with gummy vodka. Those bagels are slightly terrifying. But looks delicious. I just started following you. Love your blog, especially your background. Follow me back if you like my blog!